The Buckeye Honors Program is a complete custodial program for schools and universities that presents the products, procedures, and training needed to meet a school or university's highest standards. Buckeye's goal is to make cleaning and maintenance procedures easy and rewarding, providing products that are safer for the worker and environment that produce excellent results. The Honors Program provides training in routine cleaning, restroom, shower and locker room cleaning, carpet care, hard floor care, gym floor care, food service procedures, summer cleaning procedures, and product safety. This program presents easy to follow procedures that are researched and proven to increase efficiency and keep your school or university looking its best! The Honors website features the complete program and materials available 24 hours a day for your convenience. 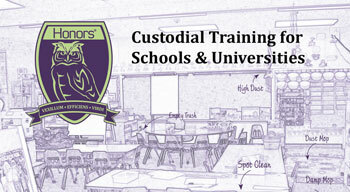 Login and view Honors training videos by segments including routine cleaning, restroom, shower and locker room cleaning, carpet care, hard floor care, gym floor care, food service procedures, summer cleaning procedures, and product safety. Corresponding with each video, you may also download customizable PowerPoint presentations, training manuals, Safety Data Sheets (SDS), product literature, and wall charts where applicable. Then assess your Honors Program knowledge with tests available for each segment. © Copyright 2019, Buckeye International, Inc. All Rights Reserved.